If the Bullitt Foundation’s Cascadia Center Living Building had been designed to meet Passivhaus, it would have needed only two-thirds of the on-site-generated energy of the current design to reach net-zero. In other words, a much smaller photovoltaic array. The Cascadia Center for Sustainable Design and Construction (website for the building) is likely to be the second building in Seattle to meet the Cascadia Green Building Council’s rigorous Living Building Challenge. Designed by Seattle starchitects Miller|Hull, with mechanical engineering by Portland’s PAE Consulting Engineers with input from the Integrated Design Lab, the building is a marvel of sophisticated active technology and expressed greenness. Motorized windows open automatically to provide cooling. Computer-controlled shades raise and lower to help maintain optimum lighting levels. Deep borings below the building tap geothermal warmth. A prominent stair with spectacular views encourages tenants to skip the elevators. There is no parking garage! (But there is bicycle parking!) 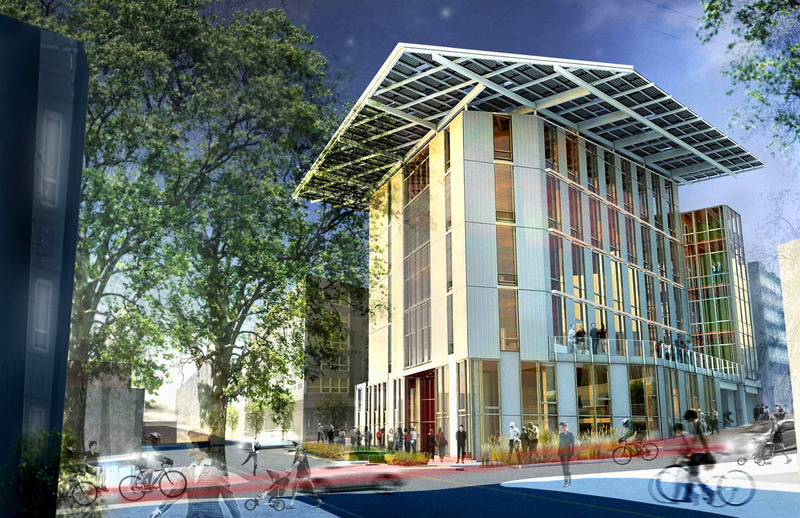 A (very) large, controversial photovoltaic “hat” tops the building. (Some call it the “comb-over.”) As stated on the building’s website, the Bullitt Foundation expects it to be the most energy-efficient commercial building in the world. I was curious about how Cascadia Center might compare with Passivhaus, in terms of its energy intelligence. After the public presentation of the building at Benaroya Hall I emailed Scott Wolf of Miller|Hull and Denis Hayes, asking if I might have information on the building necessary to make a comparison with Passivhaus. Denis responded that he would be delighted to cooperate, and Scott put me in touch with Brian Court, the project architect, and Jim Hanford, sustainability lead, both of Miller|Hull. I am grateful to each of them for facilitating this conversation and supplying the area take-offs and EUI for the current design. Before we get into the numbers, if you aren’t familiar with Passivhaus, you might want to click over to the introduction to Passivhaus on my website and back. The Treated Floor Area (based on the German DIN 277-2 method) is 39,050 SF, or 75% of the gross area. Treated Floor Area (TFA) is used in calculating energy use allowed in a Passivhaus building. The Energy Use Index (EUI) of Cascadia Center is 16. EUI is total annual energy use divided by gross square footage. The limit in Passivhaus for Primary (Source) Energy is 38 kBTU/SF/year. In Passivhaus, an energy factor is applied to various forms of energy to account for generation and transmission losses. For electricity, this factor is 2.7. The current EUI of Cascadia Center is 16. To meet Passivhaus, the EUI would have to be 10.57. A building that met Passivhaus would use 66% of the energy of the Cascadia Center as currently designed. Had the building been designed to meet Passivhaus, the photovoltaic array could have been two-thirds its current size. This has dramatic implications for future buildings seeking to meet the Living Building Challenge. Multiply that by 2.7 (the energy factor for electricity) to get the primary (source) energy usage. The building as designed exceeds the Passivhaus standard for Primary Energy by a bit over 50%. That’s worse than my Passivhaus colleague Mike Eliason of brute force collaborative calculated using guesstimates of TFA from the permit documents filed with DPD. We know that it is possible to reach Passivhaus with this building type, because there are many examples of similar buildings in Europe that meet Passivhaus (see image above), all of which would have a lower EUI than Cascadia Center if you don’t count the energy generated on site by the photovoltaic array. Therefore, it appears the Cascadia Center will not be the most energy efficient building in the world. I suspect we may see something interesting if we look closely at the air leakage, and compare Miller|Hull’s target with Passivhaus’s 0.6 ACH@50 Pascal. Proportionally the ventilation and pump energies seem high, but once all other loads are reduced, those loads might pop out more, and utilizing on-site water (to meet Living Building Challenge) requires pumping. If they were starting from scratch, it may be that by concentrating first on the siting, building massing, envelope assemblies and air-tightness (as one does in the Passivhaus design process) they would have been able to eliminate the need for some of the mechanical systems. With the internal heat gain of a typical office building, and an appropriate wall assembly, air tightness and glazing, heating load ought to go to zero, and with proper shading (as they’ve done already) cooling load should get to close to zero as well. Despite not meeting Passivhaus, Cacadia Center is a brilliant, important building. That it will be possible to better it with simpler, less expensive, less complicated and more durable means is encouraging. Since we already see dramatically lower energy use with existing Passivhaus buildings, it is clear that Passivhaus is a proven and better way to meet the “Energy Petal” of the Living Building Challenge than the active technologies employed in the design of the Cascadia Center. Good point on the Bullitt Living Building project on 15th and Madison. It should also be noted that 40 % of the projects’s PV panels are not on the site, but over the ROW’s of Madison and 15th. The project was granted an extra 10 feet in height by the City ostensibly to allow taller floor to floor heights to allow more natural daylignting in the interiors of the office floors. This added height and the lack of any significant modifications to its height, bulk and scale has successfully blocked the windows of the west facade of the existing abutting 5 story apartment aabutting the Bullitt project on the East….thus making this structure permanently un-green and un-sustainable. While there are many good measures included in the design, especially treatment of on-site water, this project has way to much mass and height. The lesson from this project is to find a larger site and develop a smaller structure that honors the existing context of the neighbors. 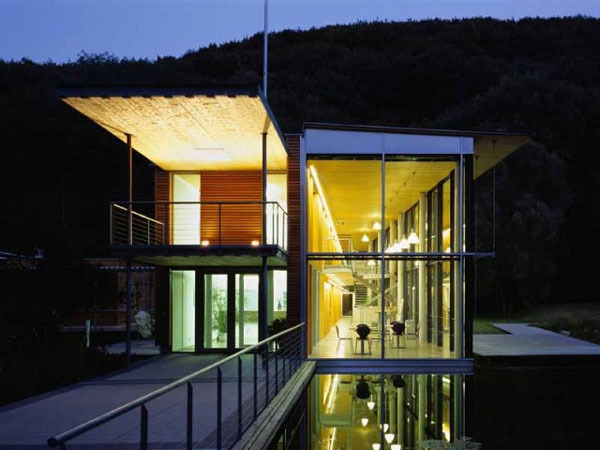 Do you have any information about the energy design strategies that were used in the German Office Building you picture by Architekturburo Reinberg? It looks like the building is split in two long-ways for solar gain on one frontage and solar screening on the other. How do they handle all those windows at night during the winter or day during the summer? I believe the split in the building is programmatic, but also dovetails with energy strategies. (I don’t read German, so I’m relying on Google translate!) With Passivhaus typically multiple strategies are employed. Sometimes it is the sum of the parts rather than one large idea. Summer shading may come from adjacent trees or buildings. Windows are triple-glazed, and much higher performance than those normally spec’d for office buildings here. Thanks. I love the passive house tutorial! Clear and informative. Your conversion factor makes no sense in an area where most of the electricity comes from HYDOPOWER!!!!! !